An RV is the perfect place to tailgate. The convenience of having comfortable seating, a full kitchen, a bathroom and an awning for outdoor sun protection simply makes the tailgating experince more enjoyable. Use these three awesome tailgating tips at the next game, concert or race you visit in your RV, and you’re guaranteed to have the best tailgating experience yet. It may feel like your RV has absolutely everything you need at all times, but throwing a pop-up party for friends and family requires a few extra items. Keep a tailgating supply checklist in your RV, including items like coolers, ice, disposable plates, trash bags and others, so you’re never stuck running to the store at the last minute. Grilling outdoors can keep a lot of the tailgating mess out of your RV, so you still have a comfortable and clean place to sleep at night. Clean your grill and make sure you have all of the proper tools to cook a large amount of food. Don’t forget to keep a portable fire extinguisher near your grill at all times. Preparing and cooking items at home can save you time and energy when it comes time to tailgate. 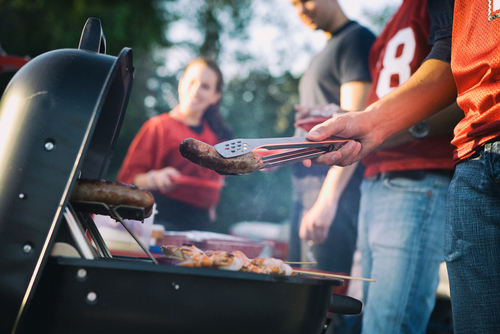 You won’t get to enjoy much of your party if you’re cooking and preparing every part of your tailgate meal while the event is happening. Form your burger patties, thread skewers, slice vegetables, make pasta salads, bake desserts and mix large batches of drinks before you head to the event, and you’ll enjoy a stress-free tailgating experience when you arrive. There’s no better place to find your perfect tailgating RV than right here at Fretz RV. We’re your one stop shop for unbeatable deals on new and used RVs, and if you’re already in your dream RV, we have all of the parts and accessories you need to make your tailgating experiences better than ever.